The purpose of this function is to allow a System Admin to use a list of People ID #s to add people to a Tag. Most of the time, you can find those to tag by using Search Builder and adding them to a Tag on the results page. However, if you have an Excel spreadsheet of People IDs, you can tag those records using this feature. Copy the column of People ID #s from your Excel spreadsheet. Paste the ID #s in the text box. Check Force New Tag if you have are using an existing Tag name and want to remove those already in that tag and add these instead. 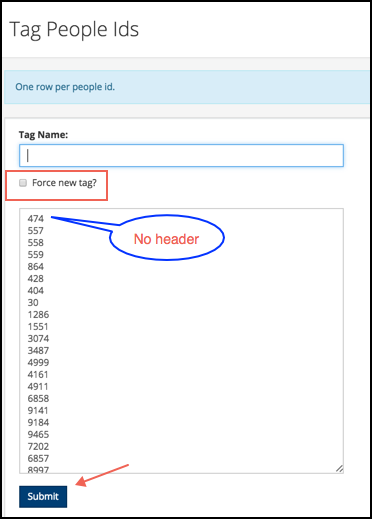 If you are unsure if you have an existing tag by that name, and you do NOT want to add to the tag if it exists, check that box as a precaution. Now you are ready to use your Tag.